Pools are closed and the summer toys are packed away for another year. The kids are back to school and settled into their routines, and the chaos of the holiday season has yet to begin. It's autumn, a time when we love to pause to take in the beauty that nature offers us as the leaves turn from deep green to brilliant shades of red and orange. Everywhere you look a rainbow of colors greets you. For a truly spectacular show, however, head for the Great Smoky Mountains, where pristine wilderness combines with a stunning array of wildlife to create a picture-perfect landscape. With 100 or more trees native to the Great Smoky Mountains, and the majority of those deciduous, it's easy to see why Eastern Tennessee is known for its colorful autumn show. As the last of the summer warmth gives way to crisp mornings and chilly evenings, the mountaintops begin to dress for the season. Glorious hues of yellow, orange, red, and purple spread across the landscape, offering a brief but beautiful scene usually found only in postcards. While you can enjoy the colors of the season by car alone, there are plenty of other ways to take in the scenery as well. Spend an afternoon on horseback and see trails and backcountry spots that few others will ever encounter. Catch sight of the local wildlife as they go about their daily chores, getting ready for winter. Squirrels and chipmunks are busy stocking their nests for the season ahead, while deer and other animals are enjoying the last of the tasty plants and flowers that will soon be gone. Hiking trails are plentiful and well maintained, and offer visitors of all skill levels the chance to get out in the wilderness for a few hours. While any trail will give you a glimpse at the spectacular scenery, for a panoramic view of the mountains you won't find anywhere else, head for Clingmans Dome. The highest point in the Great Smoky Mountains National Park, on clear days Clingmans Dome offers hikers a dazzling view that stretches nearly 100 miles. The rich reds and golds of autumn spread out below in a patchwork of color that can't be seen anywhere else, and that won't soon be forgotten. For the most vibrant colors, plan your trip to the Great Smoky Mountains for mid-to-late October. Higher elevations peak sooner than the foothills, which can put on a beautiful show well into November. Want to immerse yourself in the beauty of autumn in the Smokies? Give the hotels a pass and opt instead for a secluded cabin on a quiet mountainside. With all the comforts of home, a private cabin offers you and your entire family a chance to sample everything the area has to offer. You'll find hiking trails just steps from your door, enjoy a roaring fire on a crisp fall evening, and spend some family time in your very own game room. Surrounded by the gorgeous show Mother Nature provides, you might just find you never want to go home. 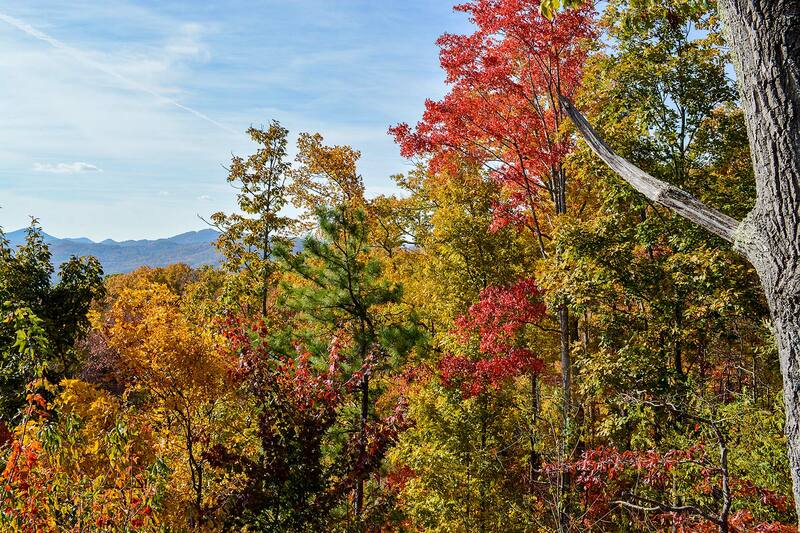 Whether you're planning a family getaway or a romantic weekend for two, the Great Smoky Mountains in October are not to be missed. Dramatic reds and vibrant yellows paint the landscape below a brilliant blue autumn sky, creating a truly gorgeous vista sure to enchant everyone in your group.